​​The site which Lakeshore Center at Okoboji is located was purchased by a lumberman from Spencer, IA by the name of Franklin Floete in 1917. The property was purchased from the Harker family who delivered milk from their dairy to the homes around the lake during the turn of the century. Mr. Floete built one of the most elaborate mansions in the Midwest consisting of 32 lavishly furnished rooms. This mansion is said to have cost a total of $135,000.00 in a time when the average worker was paid $4 or $5 per day! Many buildings from this period in Lakeshore Center's history are still in use today. For instance, the carriage house was converted into our current Canteen which houses our arts and crafts, snack shack, Lakeshore Store, and staff quarters and the ice house has become our Dugout. However, shortly after Mr. Floete died in the fall of 1922, the mansion furniture was shipped to California and while the property was maintained, it was a mere shadow of the social life of former years. In the fall of 1945 the mansion and adjoining grounds were sold to a group of wealthy Midwestern businessmen. 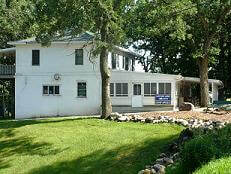 The men planned on developing the property into a membership only club to be called the Okoboji Club. Work began immediately to remodel the mansion. It was also during this period that the Duplex cabins were constructed. The Okoboji Club open on Memorial Day of 1946 and hosted several big names including Babe Ruth. However, on April 14, 1951 a fire of undetermined origin broke out at around 2:00 p.m. in the mansion and by 5:00 p.m. high winds had driven the fire so that all that remained of the mansion was smoldering ruins. Four years later, on July 1, 1954, the idea of purchasing the property came before the Sioux City Presbytery at a meeting in Cherokee, Iowa. The property was priced at $65,000.00 and the original Articles of Incorporation for the Presbyterian Camp on Okoboji were dated August 19, 1954. The first summer of camping was held in 1956, and since then campers and adults alike have come to rejuvenate beside the water of West Lake Okoboji allowing God to touch them in a way that changes their lives. In 2009, Lakeview Lodge was completed. This is an adult-friendly facility with private hotel-styled rooms with private baths. It has two bunk rooms which sleep 15 people each. There are a number of meeting rooms and a recreation room. With the addition of the Lodge, the Presbyterian Camp on Okoboji moved into a year round facility that serves children, youth, and adults. With this shift, it was felt that the word "Camp" did not describe us adequately for people think of bunk beds and children when they hear "Camp". On January 1, 2014, the Camp Board put into place a marketing name of Lakeshore Center at Okoboji, a ministry of the Presbyterian Church (USA). The name change reflects our desire to be a sacred space where all may come and experience God. All are welcome. One does not need to be Presbyterian to come and enjoy this facility. Summary from "From Vision to Reality"